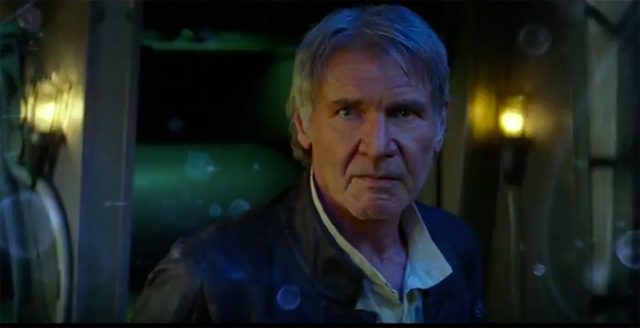 The new trailer for ‘Star Wars: Episode VII — The Force Awakens’ was released on Monday night — and it delivered. Unfortunately, JJ Abrams’ political activism also has awakened the kind of Grade-A trolling one can only find via Twitter. Luke Skywalker: You don’t believe in the Force, do you? Han Solo: Kid, I’ve flown from one side of this galaxy to the other, and I’ve seen a lot of strange stuff, but I’ve never seen *anything* to make me believe that there’s one all-powerful Force controlling everything. ‘Cause no mystical energy field controls *my* destiny. It’s all a lot of simple tricks and nonsense. Now, after years of experience, Solo sounds like a former atheist who has experienced the metaphysical first-hand. Han Solo: It’s true. All of it. The Dark Side. The Jedi. They’re real. 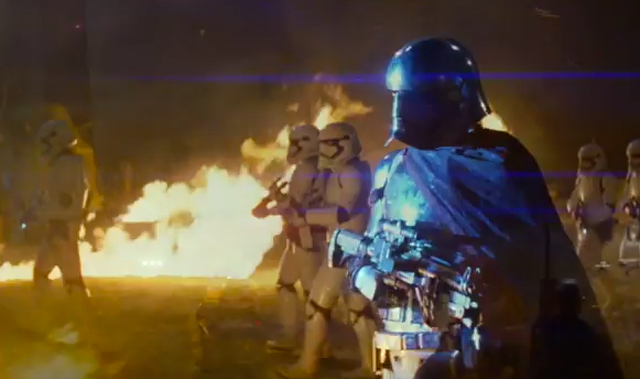 ‘The Force Awakens’ looks like it will have something for everyone. If successful, it will be a beautiful bridge between generations of fans. While it sounds far-fetched for ‘The Force Awakens’ to be “anti-white,” it is not hard to believe Abrams would allow politics into his films — because he has done it before. ‘Star Trek: Into Darkness’ courted controversy when its writers and star actor Benedict Cumberbatch explicitly said it was social commentary on the Bush administration’s foreign policy. It was also just over one week ago that Abrams helped raise $750,000 for the Democratic Party at his Pacific Palisades, California, home. After a praise-heavy intro by the Star Wars director, Obama spent about an hour and 15 minutes “passionately” talking to around 20 guests about issues such as gun control, prison reform, voter turnout and the economy, according to one source. The event was estimated to have raised over $750,000 for Democratic Party war chest, say insiders. In town for the afternoon, Obama was speaking in the living room of the Pacific Palisades home of Abrams and his wife Katie McGrath at a $33,400-a-ticket roundtable. The event at the Star Wars director and longtime supporter’s pad to raise cash for the Democratic Senatorial Campaign Committee was the first of three fundraisers POTUS will hit while in Los Angeles for less than 7-hours today. It is highly unlikely Disney would allow its first ‘Star Wars’ movie to get too heavy-handed with politics, but it is not unreasonable to believe Abrams would stitch his own activist politics into the finished product. My prediction: ‘The Force Awakens‘ will be a fun movie that people of all ages and ethnicities can enjoy, even if there are subtle instances where JJ “I -hold-huge-Hollywood-fundraisers-for-Democrats” Abrams tries to sneak his own brand of activism into the finished product. That is par for the course in Hollywood. The key thing is to simply be aware of it when it happens. This’s the first I heard of anyone organizing a boycott of “The Force Awakens” over J.J. Abrams’ political beliefs. Traveling in some “Star Wars” fan circles, I was aware that there’s a good percentage of fans that want to boycott the movie over the “Legends” decision. (If you’re not familiar with what I’m talking about, LucasFilm has been creating “Star Wars” tie-in media since “A New Hope.” Most of this material created its own timeline of events that went way beyond the movies and was kinda-sorta considered part of the official continuity largely by default. When Disney bought LucasFilm and decided to continue the “Star Wars” film series, the tie-in media was rebooted from scratch to remain constant with the movie versions and the pre-Disney material, re-dubbed “Star Wars: Legends,” was officially declared non-canon. “Captain America: The Winter Soldier” respectively, but failed spectacularly. So, I’m not very enthusiastic about Abrams directing the next installment of another franchise I love, but I will concede that he would be better suited for the “Star Wars” universe rather than “Star Trek,” and am inclined to give him the benefit of the doubt until I see “The Force Awakens” for myself. My prediction for the movie is that it wants to be the “Jurassic World” of the “Star Wars” franchise; a movie that reinvents the franchise to take it into a new era after a chain of films that many fans found disappointing, makes a boatload of money, has great new characters that can carry the franchise going forward, and Easter eggs and thematic material that hearkens back to the original installment of its franchise. After those paragraphs of rambling, I do have a question. On this blog, there’s a lot of discussion on how the political and personal beliefs of people who work in the entrainment industry affect the products they make. It’s a good discussion topic, but is there a point where the comic book/novel/movie/whatever and the author’s beliefs should be examined separately? Case in point, until we see evidence that “The Force Awakens will be making political statements, shouldn’t Abrams’ beliefs about government be examined as a different issue? I do understand you’re mostly saying: “I hope that the two don’t blend together, since Abrams has done it before,” but isn’t Abrams job as a filmmaker separate from whatever he does in political activism? As an analogy, if someone was analyzing your skills at your job, wouldn’t you want them to judge you by the work you did for your boss, not because they disagreed with an opinion you wrote about on this blog? Anyways, I hope when the movie comes out, you’ll be sharing your thoughts on it. I do understand you’re mostly saying: “I hope that the two don’t blend together, since Abrams has done it before,” but isn’t Abrams job as a filmmaker separate from whatever he does in political activism? The problem is that writers and artists so often do not see separation between the two and, in fact, consider it their social responsibility to shape the culture in line with progressive politics. That is why you get weird Law and Order issues on GamerGate. That is why illegal immigration is covered in Captain America comics, but not Islamic terrorist networks, etc. Politics and popular culture overlap, as evidenced by the massive fundraisers held in Hollywood for Democrats. One of the main objectives of this blog has been from its inception is to show those instances where the two intersect. I’ll definitely be reviewing the movie when it comes out, but I’m not sure if I’ll be there opening weekend. I think it might be a bit too crazy for my tastes. Both of you might find this article by Jonah Goldberg to be informative and relevant to the question of artists & influence. -Of course Abrams should be able to separate his activism from his work; so should the people who write Marvel comics, and open-source programmers, and on and on. But SJWs don’t believe in separating activism from their work, period. -Was anyone upset about the “black stormtrooper” thing? I think people were more confused than anything. A lot of people thought that the stormtroopers were all still clones (and as far as I know in the movies this was never shown not to be the case). I saw a ton of “people are upset about a black stormtrooper? !” preening articles but I didn’t actually see what the source was supposed to be. 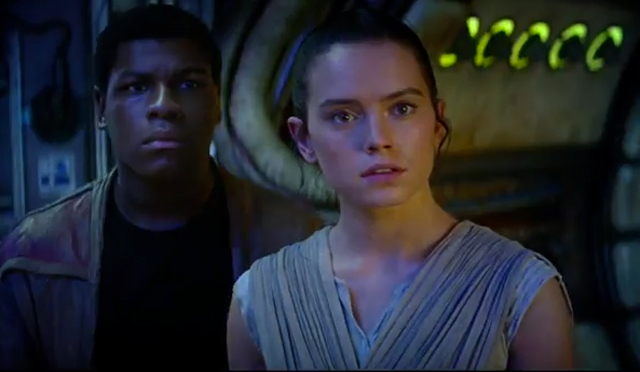 -I am pretty irritated that the main characters of this new Star Wars movie are a woman and a black guy. Of course the universe is full of people of all kinds, so you could have lizard people as the heroes or whatever you want, but Star Wars is primarily a thing that appeals to white people. It doesn’t have nearly the cachet in black culture, even though Lucas went out of his way to appeal to them by casting cool black guys in almost all of the movies. But it’s not acceptable for there to be a “white people thing” anymore. We have to force some diversity in there, even if it serves no purpose, just to remind white people that nothing should ever belong to them, and nothing should ever be marketed directly to them. It’s like if they made a Shaft sequel where Samuel L. Jackson teaches a young white woman to be cool and be a tough no-nonsense cop. Given the preceding film you’d just expect it to be a black male character, and putting a white female character there is distracting. Was anyone upset about the “black stormtrooper” thing? I think people were more confused than anything. A lot of people thought that the stormtroopers were all still clones (and as far as I know in the movies this was never shown not to be the case). I saw a ton of “people are upset about a black stormtrooper? !” preening articles but I didn’t actually see what the source was supposed to be. Eidolon: You completely lost me on how having Finn and Rey as the leads of the movie is “forcing” diversity into “Star Wars.” First of all, why does creating characters that happen to have different genders and ethnic backgrounds mean that it’s being “forced?” Second of all, I don’t get the “Shaft” analogy, since there, preexisting characters are being reinterpreted to create diversity, whereas Finn and Rey are simply being made as a woman and a black man from the get-go. Also, while a sequel to “Return of the Jedi,” the new movie is also acting as a sort-of spin-off, so why can’t we see characters from different backgrounds than we did in the previous ones, which centered around two generations of the same family? I’m also pretty sure that “Star Wars” appeals to a wide range of people beyond the WASP demographic, but even if it was mainly white people, what’s the problem with having non-white male characters as the leads or major characters? If the characters are interesting, well-acted, and add to the movie, then they’re a success (I don’t hear much complaining about casting Samuel L. Jackson as Nick Fury). Besides, there will be white people in it. Besides the main characters from the original trilogy, Poe, a new major character, is a white male, and it remains to be seen what Kylo Ren and Capt. Phasma are. Not trying to be rude, Eidolon, but the argument comes across as a little paranoid to me. I don’t think that J.J. Abrams and LucasFilm had some anti-white agenda in mind when breaking the “Force Awakens” story and characters. I think their main interest was in creating characters the audiences would be intrigued by and enjoy, and so far, I think that the odds of that happening are good. I agree with you in that I do not believe Abrams has some sort of “anti-white” agenda, and wish the people who got the #BoycottStarWarsVII hashtag tending simply brought attention to the director’s political activism in general. With that said, when I read a comment like Eidolon’s I think his frustration is a rational result of the political environment SJWs have created. SJWs never argue that Saudi Arabia would benefit from more “whiteness” — and in fact to suggest such a thing would probably be considered “racist.” SJWs never argue China could use a healthy dose of “whiteness.” SJWs never argue Mexico would be a better if a few million white Americans learned Spanish and took up shop. The diversity train only seems to go in one direction. Side note: Regular readers know that I married a minority, so the first person who implies I’m secretly yearning for the South to rise again will get laughed out of the comments section. I doubt there’s a lot of force ( no pun intended) behind the boycott hashtag. The left loves a good “It’s 2015 and there are still people who…” Premise to justify their ideology. Even if the movement was made of just a dozen nuts and trolls, there are enough SJWs on Twitter to get the hashtag trending from their patronizing condemnation alone. It’s all an exercise in SJW self congratulation. See for yourself and look at the hashtag on Twitter. See what the ratio of SJWs condemning all you racists out there to actual racists hating on Boyega is. I doubt you’ll be surprised. Whereas you and I can say, “Yes, racism exists, but in the U.S. it doesn’t have the power to dictate the overall trajectory of a man’s life if he is virtuous,” the SJW seemingly equates any episodic instance of racism to proof we’re still essentially living in 1861. 4Chan, the infamous website that’s earned the ire and admiration of many an Internet user, was the one behind the #‎BoycottStarWarsVII‬ hashtag. Taking a hotly controversial subject (that of course being racial diversity), and turning it into an online hoax that set the web on fire. Everyone from the feminist propaganda mill TheMarySue, to the extreme leftist hacks over at Salon.com, and surprisingly enough even Armin of the ComicBookCast himself, had all fallen for this obvious hoax. All of whom had taken to their soapboxes espousing that the people behind this hashtag were just ignorant racists afraid of change, all while being none the wiser that they were being played like puppets. I’ve included a link to a thread on Reddit where the evidence that many of the media outlets failed to mention, let alone research.